Ottawa Journal, 4 October 1918, page 14, column 5. In October 1918, the female teachers of the Ottawa Public School Board launched a campaign to improve their salaries. Two months later, female English lay teachers of the Separate School Board came forward with the same request. Over the next year, female teachers faced both successes and setbacks in their fight for fair pay and recognition. The wartime economy had drastically increased the cost of living in Ottawa. It was estimated to have doubled from 1914 to 1919. Meanwhile, teachers had received few to no pay raises over the war years. This affected women teachers particularly, since they were paid far less than men—sometimes receiving half the salary of a man in the same rank and position. Although “equal pay for equal work” was a popular theory, school board trustees, who were almost all men, believed male teachers deserved more money because they were more in demand. Ottawa Journal, 9 November 1918, page 19, column 4. Ottawa Journal, 16 November 1918, page 2, column 1. Facing resistance and cash-strapped school boards, the teachers responded in different ways. In November 1918, public school teachers formed the Carleton East branch of the Federation of Women School Teachers of Ontario. The chairs of the new branch were Miss G.E. Macpherson of Breezehill Avenue School (now Devonshire Community Public School) and Miss Christie of Westboro Public School. 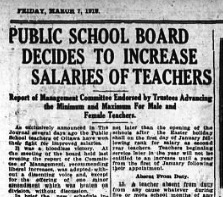 In March 1919, public school teachers achieved success when the board raised salaries for all teachers: Ottawa public school teachers could now achieve the highest salaries of teachers in any Ontario city. However, the new schedule was still lower than what the women had hoped for. Ottawa Journal, 18 December 1918, page 4, column 3. Soon after, the Women’s Association of Separate School Teachers joined the Federation of Women School Teachers of Ontario, and on 14 May 1919, forty-four English lay teachers went on strike amidst cheers from students. The school board issued an ultimatum telling them to return to work next Monday or be fired. However, before this could happen, the Ontario Minister of Education “wired the teachers that he will arrange terms satisfactory to them” (Ottawa Journal, 16 May1919). The teachers returned to work on Monday. Ottawa Journal, 26 February 1919, front page. While female teachers had some of their demands met in 1919, the fight for a living wage never truly ended. Salary negotiations for public school teachers continued throughout 1919, and separate school teachers went on strike again later that year due to board conflict. During this time, the Separate School Board lost twenty-one teachers. Despite their hardships, female teachers in Ottawa achieved high levels of public interest and support through their campaign. The Ottawa Journal covered their story as front-page news even in the last months and aftermath of the First World War, showing the importance of teachers to early twentieth-century Ottawans. In a time when women were literally not as valued as men in the workforce, this campaign brought to light the necessity of a living wage for female teachers, who were all unmarried, and often very young. Through their struggle, female teachers revealed how far they would go to achieve the support that they deserved. Ottawa Journal, 7 March 1919, page 13, columns 1-2. This story was researched and developed by Francesca Brzezicki as a contribution to the Workers’ History Museum’s Capital History Kiosk’s project for Ottawa 2017. It formed part of her course work for Professor David Dean’s graduate seminar on museums, national identity, and public memory (Department of History, Carleton University).